Time-series images made by cameras onboard the Hubble Space Telescope show the evolution of the inner remnant of Supernova 1987A. Hubble SpaceTelescope observations of the aftermath of a giant star explosion are offeringa new glimpse into the events that follow the collapse of a massive dying star. Thiswell-known supernova remnant in a neighboring galaxy has been studied for morethan 10 years, but the recent observations could glean new knowledge of how suchstellar debris helps shape the evolution of galaxies. The newstudy, led by Kevin France, a research associate at the Center for Astrophysicsand Space Astronomy at the University of Colorado in Boulder, targeted theremnants of star SN1987A, which was first discovered in 1987. "Thesestars are so massive that they use their fuel very quickly," France toldSPACE.com. "Our sun lives for billions and billions of years because it'skind of a middle-weight star." In asupernova explosion, the material that made up the insides of the star and itssurrounding atmosphere is ejected into the galaxy by a blast wave. Huge amountsof matter and energy are dispelled into what is known as the circumstellarenvironment. Theinteraction of the stellar debris with this circumstellar environmentcreates a system called a supernova remnant. By studying this process and thecomposition of the emissions, astronomers continue to unlock clues about theevolution of galaxies. France andhis colleagues used Hubble's spectroscopic observations to examine thecomposition of the ejected material, and to determine how quickly it isinteracting with the circumstellar environment. Theydetected plenty of heavy elements ? ranging from oxygen to iron ? that wereproduced in the explosion being deposited into the galaxy via the supernova's blast wave. "Wedetected highly ionized nitrogen for the first time coming from the very hotgas," France said. "We also saw a lot of hydrogen emissions. Hydrogenis the most abundant element in the universe, so it's not surprising that we'reseeing a lot of it." What was surprising,however, was the fact that the hydrogen emissions were brightening over thecourse of about 10 years. "Thisbrightening is telling us that more and more emission is being produced, andit's becoming more intense," France explained. "But, what it's reallydoing is telling us the amount of material that is crossing into theinteraction zone where the blast wave is interacting with the circumstellarmaterial." In theHubble images of SN1987A, what looks like a string of pearls appears around thesite of the former star. These "pearls" of circumstellar material aremade up of material that was emitted before the star exploded, as it waspreparing to die. Light fromthe supernova itself illuminates the pearls (as seen in these images of thesupernova), and as the supernova debris interacts with the circumstellarmaterial over time, the pearls will eventually form a continuous ring aroundthe remnant, France said. The newstudy is detailed in the Sept. 3 issue of the journal Science. SN1987A is about150,000 light-years away from Earth on the outskirts of the Tarantula Nebula in the Large Magellanic Cloud, thenearest galaxy to our own Milky Way. The age ofthe original star that set off the explosion remains unclear, but is estimatedto be between 5 and 10 million years. Thewell-studied supernova was first discovered by an observer serendipitously. "Hewent outside with a telescope and looked up at the Large Magellanic Cloud andthought he saw a new star there," France said. "Since that doesn'thappen every day, they turned just about every telescope that could be turnedtoward it, and it turns out we actually caught one of these stars exploding,pretty much from day one. It has really allowed us an unprecedented look at ayoung supernova remnant." 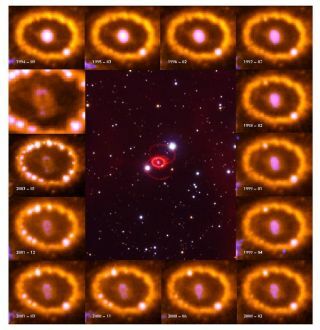 The earlydetection has allowed astronomers to observe the evolution of SN1987A fromyear-to-year on a human timescale ? a rarity in astronomy. Analysis ofthe remnant's evolution over time showed that the shock wave from the supernovaexpanded into the circumstellar environment before rebounding back again. "If youimagine the string of pearls ? instead of being a clump of gas, imagine itbeing just a solid barrier," France said. "The material from theblast wave has gone out, run into the inside of this string, and then bouncedback." Theresearchers were able to determine that the ejected material in the blast wavewas traveling at a blistering speed as it was dispelled outward ? about 4percent the speed of light. "Lightmoves pretty quick, so seeing material move at even a few percent of the speedof light is pretty significant," France said. Furthermore,a supernova's powerful and intense effect on its immediate environment couldtrigger much larger cosmic interactions, France said. "Theydo produce so much energy that they tend to shape how a galaxy evolves over time," he said. "There aren't other processes in a typical galaxy that are as energetic asa supernova. If enough of these things happen, these could be the big playersin determining how a galaxy evolves."